Nobel committee: Obama has created "new climate in international politics"
(CNN) -- In winning the Nobel Peace Prize, President Obama joins an elite group of U.S. presidents. He is the fourth to win the prize, the third to win it while in office and the first to receive it during his first year in office. President Obama delivers remarks at the White House on Friday after winning the Nobel Peace Prize. Unlike his predecessors, Obama was selected not for substantive accomplishments, but for his "vision" and inspiring "hope" at the beginning of his presidency. "For 108 years, the Norwegian Nobel Committee has sought to stimulate precisely that international policy and those attitudes for which Obama is now the world's leading spokesman," the committee said, explaining its decision. 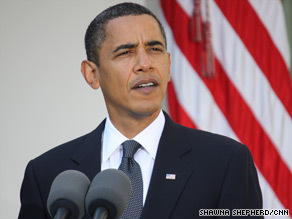 Obama will donate the roughly $1.4 million award to charity, a White House spokesman said Friday. President Theodore Roosevelt won the prize in 1906, as did President Woodrow Wilson in 1919. Former President Carter had been out of office for more than 20 years when he won in 2002. Former Vice President Al Gore shared the prize in 2007. The Nobel committee's Web site describes Roosevelt as president and "collaborator of various peace treaties." The site points out that he "took the initiative in opening the international Court of Arbitration at The Hague." The United States and Mexico presented a difference before the court, and, "When this example was followed by other powers, the arbitration machinery ... was finally called into operation." Roosevelt also "played a prominent part in extending the use of arbitration to international problems in the Western Hemisphere" and "offered his good offices as mediator between Russia and Japan," which helped lead to a 1905 peace treaty ending the Russo-Japanese War, the Web site said. iReport.com: Does Obama deserve it? The site noted that Wilson was not only president but founder of the League of Nations. Wilson led the nation through World War I, but "people everywhere saw in his peace aims the vision of a world in which freedom, justice and peace could flourish." At the 1919 Peace Conference in Versailles, France, he "failed to carry his total conception of an ideal peace, but he did secure the adoption of the Covenant of the League of Nations," the site noted, adding that his "major failure" was at home "when the Senate declined to approve American acceptance of the League of Nations." The Nobel site said Carter was selected "for his decades of untiring effort to find peaceful solutions to international conflicts, to advance democracy and human rights, and to promote economic and social development." "During his presidency (1977-1981), Carter's mediation was a vital contribution to the Camp David Accords between Israel and Egypt, in itself a great enough achievement to qualify for the Nobel Peace Prize," the committee said in 2002, adding that after his presidency Carter took on "extensive and persevering conflict resolution on several continents." And Gore was chosen, along with the Intergovernmental Panel on Climate Change, "for their efforts to build up and disseminate greater knowledge about man-made climate change, and to lay the foundations for the measures that are needed to counteract such change." Gore "is probably the single individual who has done most to create greater worldwide understanding of the measures that need to be adopted," the committee said in its 2007 announcement. "The committee has attached special importance to Obama's vision of and work for a world without nuclear weapons," the statement said. "Obama has as president created a new climate in international politics. Multilateral diplomacy has regained a central position, with emphasis on the role that the United Nations and other international institutions can play. Dialogue and negotiations are preferred as instruments for resolving even the most difficult international conflicts." The committee added, "Only very rarely has a person to the same extent as Obama captured the world's attention and given its people hope for a better future."